The Jaguar E-Type has one of the most instantly recognisable shapes of any sports car, ever. Its body shell was derived from the D-Type. A production racer, par excellence, the D-Type won the Le Mans 24 Hours race. Of course, the E-Type cleaved cleanly through air ... as long, low, and sleek, as it was. Road-holding was also a forte. Though its cross-ply tyres were supermodel thin, hard cornering induced nary a wobble. The E-Type was a Sixties icon. Anyone who was anyone wanted one! Rock stars and footballers were especially susceptible! In the end, though, the E-Type transcended mere celebrity. When exhibited at New York's 'Museum of Modern Art', it became, de facto, a design classic! Power came courtesy of Jaguar's 3.8-litre XK. Though a bit long in the tooth, even then, it could still pack a punch! The gracefully rising contours of the E-Type's bonnet were there, first and foremost, to accommodate the XK engine. 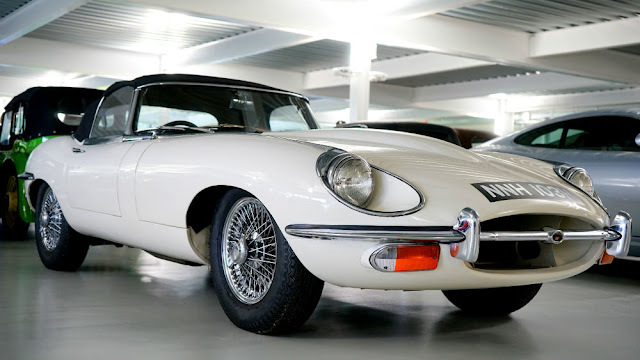 Both aesthetically and technically, then, Jaguar's E-Type was a tour de force. A shortlist to define 'Swinging London' would simply have to include the 'E-Type Jag'!